The costs for Enbridge to clean up the 2010 Marshall, Michigan oil spill now far exceeds the maximum estimate that the Joint Review Panel gave for a major spill on the Northern Gateway Pipeline and also exceeds the amount of money the JRP ordered Enbridge to set aside to deal with a spill. Enbridge’s cleanup costs have also now edged past the higher liability amount requested by the Haisla Nation. According to the US firm Enbridge Energy Partners’ filing with the United States Securities and Exchange Commission, as of September 30, 2013, the cost of cleanup was $1.035 billion US, not including possible additional fines and penalties that might be imposed by US authorities in the future. In its decision, the Joint Review Panel estimated the cost a major oil spill from the Northern Gateway project would be about $693 million. As part of the 209 conditions, the JRP ordered Enbridge to set aside “financial assurances” totaling $950 million. Note all costs in this article are for a pipeline breach. The Joint Review Panel had different estimates for a tanker spill and the liability rules for marine traffic are different from pipelines. In its filing for the third quarter of 2013, with the SEC, Enbridge Energy Partners say that the cost up until September 2013 had “exceed[ed] the limits of our insurance coverage.” The same filing says that Enbridge is in a legal dispute with one its insurers. We continue to perform necessary remediation, restoration and monitoring of the areas affected by the Line 6B crude oil release. All the initiatives we are undertaking in the monitoring and restoration phase are intended to restore the crude oil release area to the satisfaction of the appropriate regulatory authorities. As of September 30, 2013, our total cost estimate for the Line 6B crude oil release is $1,035.0 million, which is an increase of $215.0 million as compared to December 31, 2012. This total estimate is before insurance recoveries and excluding additional fines and penalties which may be imposed by federal, state and local governmental agencies, other than the Pipeline and Hazardous Materials Safety Administration, or PHMSA, civil penalty of $3.7 million, we paid during the third quarter of 2012. 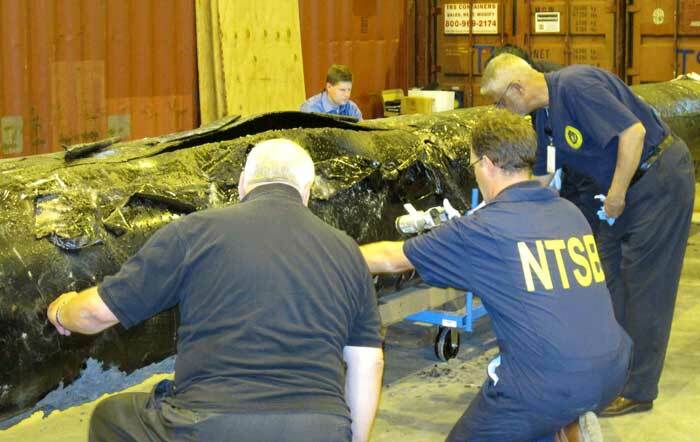 On March 14, 2013, we received an order from the EPA, or the Environmental Protection Agency, which we refer to as the Order, that defined the scope which requires additional containment and active recovery of submerged oil relating to the Line 6B crude oil release. We submitted our initial proposed work plan required by the EPA on April 4, 2013, and we resubmitted the workplan on April 23, 2013. The EPA approved the Submerged Oil Recovery and Assessment workplan, or SORA, with modifications on May 8, 2013. We incorporated the modification and submitted an approved SORA on May 13, 2013. The Order states that the work must be completed by December 31, 2013. The $175.0 million increase in the total cost estimate during the three month period ending March 31, 2013, was attributable to additional work required by the Order. The $40.0 million increase during the three month period ending June 30, 2013 was attributable to further refinement and definition of the additional dredging scope per the Order and associated environmental, permitting, waste removal and other related costs. The actual costs incurred may differ from the foregoing estimate as we complete the work plan with the EPA related to the Order and work with other regulatory agencies to assure that our work plan complies with their requirements. Any such incremental costs will not be recovered under our insurance policies as our costs for the incident at September 30, 2013 exceeded the limits of our insurance coverage. According to the SEC filing, the breakdown of costs include $2.6 million paid to owners of homes adversely impacted by the spill. Despite the efforts we have made to ensure the reasonableness of our estimates, changes to the recorded amounts associated with this release are possible as more reliable information becomes available. We continue to have the potential of incurring additional costs in connection with this crude oil release due to variations in any or all of the categories described above, including modified or revised requirements from regulatory agencies in addition to fines and penalties as well as expenditures associated with litigation and settlement of claims. For the nine month periods ended September 30, 2013 and 2012, we made payments of $62.3 million and $120.9 million, respectively, for costs associated with the Line 6B crude oil release. For the nine month period ended September 30, 2013, we recognized a $2.6 million impairment for homes purchased due to the Line 6B crude oil release which is included in the “Environmental costs, net of recoveries” on our consolidated statements of income. As of September 30, 2013 and December 31, 2012, we had a remaining estimated liability of $265.9 million and $115.8 million, respectively. The claims for the crude oil release for Line 6B are covered by the insurance policy that expired on April 30, 2011, which had an aggregate limit of $650.0 million for pollution liability. Based on our remediation spending through September 30, 2013, we have exceeded the limits of coverage under this insurance policy. During the third quarter 2013, we received $42.0 million of insurance recoveries for a claim we filed in connection with the Line 6B crude oil release and recognized as a reduction to environmental cost in the second quarter of 2013. We recognized $170.0 million of insurance recoveries as reductions to “Environmental costs, net of recoveries” in our consolidated statements of income for the three and nine month periods ended September 30, 2012 for the Line 6B crude oil release. As of September 30, 2013, we have recorded total insurance recoveries of $547.0 million for the Line 6B crude oil release, out of the $650.0 million aggregate limit. We expect to record receivables for additional amounts we claim for recovery pursuant to our insurance policies during the period that we deem realization of the claim for recovery to be probable. In March 2013, we and Enbridge filed a lawsuit against the insurers of our remaining $145.0 million coverage, as one particular insurer is disputing our recovery eligibility for costs related to our claim on the Line 6B crude oil release and the other remaining insurers assert that their payment is predicated on the outcome of our recovery with that insurer. We received a partial recovery payment of $42.0 million from the other remaining insurers and have since amended our lawsuit, such that it now includes only one insurer. While we believe that our claims for the remaining $103.0 million are covered under the policy, there can be no assurance that we will prevail in this lawsuit. 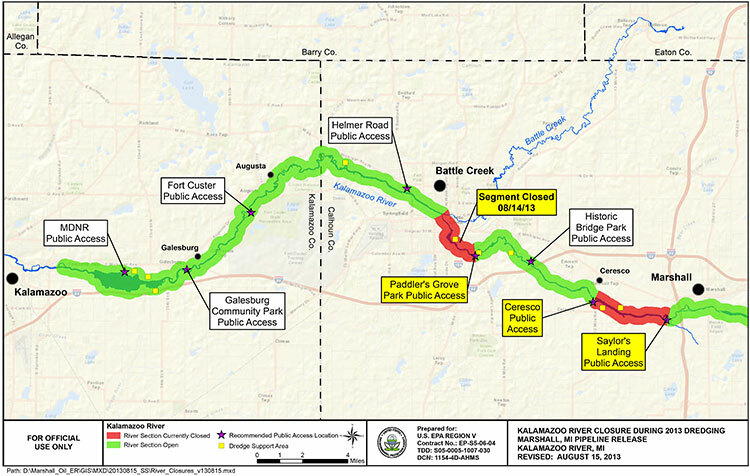 The Joint Review Panel based its finding on the Marshall, Michigan spill on the figure of $767 million from the summer of 2012 –again showing the limitations of the JRP’s evidentiary deadlines since the costs are now much higher. Northern Gateway considered the high costs of the Marshall, Michigan spill, which were at least $252,000 per cubic metre ($40,000 per barrel), to be an outlier or a rare event because the spill occurred in a densely populated area, because the pipeline’s response time was abnormally long, and because there was the prospect of potentially lengthy legal proceedings. Enbridge assured the JRP that the corporate culture and management changes and equipment upgrades since the Marshall, Michigan spill lowered that chances of a similar event. The JRP says Northern Gateway relied on its analysis of literature, and spill events experienced by Enbridge and other liquid hydrocarbon carriers in Alberta and British Columbia. After assessing all of this information, Northern Gateway regarded the high costs of a cleanup as “conservative”–meaning the company expects costs to be lower than its estimates in evidence before the JRP. In Northern Gateway’s view the most costly pipeline spill incident would be a full-bore oil pipeline rupture, with an estimated cost of $200 million, and an extremely low probability of occurrence. In their evidence, the Haisla (and other First Nations and intervenors) were doubtful about Northern Gateway’s assurances. The Haisla asked that Enbridge have a minimum of $1 billion in liability, an amount Enbridge has now exceeded in Michigan. Haisla Nation estimated the cost of damage to ecosystem services because of a terrestrial oil spill from Northern Gateway’s pipeline would be in the range of $12,000 to $610 million for a 30-year period. The Haisla’s cost estimates were based on values for environmental goods and services and probabilities of spills that were independent of Northern Gateway’s parameters for estimating oil spill costs. In contrast to Northern Gateway’s estimated spill frequency and costs, the Haisla predicted that spills would occur more often and placed a higher value on damages to environmental goods and services. 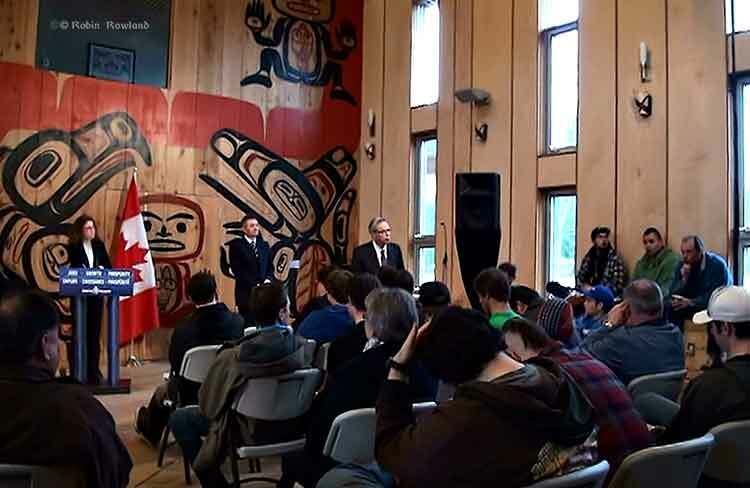 Haisla Nation argued that Northern Gateway overestimated its ability to detect and respond to a spill. In the Haisla’s view this resulted in the cost of a spill and the requisite financial assurances being understated. Haisla cited several factors, including: remote location, limited access, challenging terrain, seasonal conditions, and river flow conditions that would cause the cost of cleaning up a spill in the Kitimat River valley to be significantly greater than the costs associated with Enbridge’s Marshall, Michigan spill. Northern Gateway said that Haisla’s findings were based on a number of fundamental methodological flaws and a lack of probability analysis to support the high frequency of occurrence of oil spill events. Northern Gateway argued that Haisla’s estimates of ecosystem service values were inflated because they were based on values from unrelated studies. In Northern Gateway’s view, Haisla relied on high passive use values that were not justified. As it has in most of its decision, the JRP accepted Northern Gateway’s evidence, including its explanation of the Marshall, Michigan spill and then went on to base its spill cost estimates not on a pipeline breach but on the 2005 railway spill at Lake Wabumum, near White Sands, Alberta. The Panel accepts that the cleanup costs for the Marshall, Michigan spill were orders of magnitude higher because of the extended response time. In this application, the Panel accepts Northern Gateway’s commitment to complete the shutdown in no more than 13 minutes after detection. For this reason the Panel did not use the Marshall spill costs in its calculations. The spill volume and the resulting costs are directly dependent on the Northern Gateway’s control room staff and the pipeline control system fully closing the adjacent block valves no longer than 13 minutes from the detection of an alarm event, as well as the amount of oil which would drain out of the pipeline after valve closure due to elevation differences. The Panel decided on a total unit cost of $138,376 per cubic metre ($22,000 per barrel). This is midway between the unit cost of $88,058 per cubic metre ($14,000) per barrel proposed by Northern Gateway and the unit cost of $188,694 per cubic metre ($30,000 per barrel) for the Lake Wabamun spill. It is about one-half of the Marshall spill’s unit cost. Giving weight to the Lake Wabamun costs recognizes actual costs experienced in a Canadian spill and the greater costs of spills in high consequence areas. In these areas, individuals, populations, property, and the environment would have a high sensitivity to hydrocarbon spills. The deleterious effects of the spill would increase with the spill volume, the extent of the spill, and the difficulty in accessing the spill area for cleanup and remediation. Using these spill volume and unit cost values in the calculation below, the Panel estimated the total cost of a large spill could be $700 million. Total cost of a spill = 31,500 barrels x $22,000 per barrel = $693 million, or $700 million when rounded up. iii. Financial backstopping via parental, other third party guarantees, or no fault insurance of at least $250 million to cover costs that exceed the payout of components i. and ii. The financial backstopping would be available to fill the gap if the spill volumes or unit costs were under-estimated or if the payout from the core coverage would be less than 100 per cent. The evidence indicates that there is some probability that a large oil spill may occur at some time over the life of the project. In these circumstances the Panel must take a careful and precautionary approach because of the high consequences of a large spill. The Panel has decided that Northern Gateway must arrange and maintain sufficient financial assurances to cover potential risks and liabilities related to large oil spills during the operating life of the project. So the JRP decision comes down to this, if you accept Northern Gateway’s position that pipeline spills are rare and mostly small, then the company has the financial resources to cover the damage. If, however, Northern Gateway is wrong and the costs of a pipeline cleanup exceed the $950 million required by the Joint Review Panel, as has happened in Michigan, then those JRP conditions are already obsolete. Enbridge has missed the US Environmental Protection Agency’s deadline to clean up parts of the Marshall, Michigan bitumen spill by December 31, 2013. The EPA had already granted Enbridge a 10 month extension that the company requested in March, 2013, setting the new December deadline. In November, Enbridge requested a second extension. The EPA denied that request. From the EPA letter it appears that, as in previous years, Enbridge is trying to avoid continuing clean up work into the winter. The EPA rejects that position, telling Enbridge it shouldn’t wait until the spring run off could spread the sunken bitumen. The letter to Enbridge, from Jeffrey Kimble, Federal On-Scene Coordinator denying the extension is another scathing indictment of Enbridge’s attitude toward the public and the cleanup, citing Enbridge failing to prepare “adequate contingency plans,” by failing to recognize the “serious opposition” the dredging plans. Although the EPA had told Enbridge to consider alternative plans—and Enbridge claimed it did that—the EPA found the Enbridge’s own logs showed the company didn’t start considering alternatives until it was obvious that Comstock Township would reject their dredging plans. Although we recognize that the work required by the Order is unlikely to be completed by December 31, 2013, U.S. EPA believes that had Enbridge taken appropriate steps earlier as requested, it would not require an extension now. In particular, U.S. EPA believes that Enbridge has continuously failed to prepare adequate contingency plans for a project of this nature. For example, U.S. EPA acknowledges that failure to obtain a site plan approval for use of the CCP property for a dredge pad was a setback in the timely completion of the work in the Delta. Although your letter claims that Enbridge “has considered such alternatives,” your logs indicate that Enbridge did not hold initial discussions with the majority of these property owners until long after the final decision to abandon plans for use of the CCP property. These contact logs do not demonstrate that Enbridge fully explored and reviewed alternative options in a timely manner so as to avoid delay in completion of the work. Although Enbridge claims that use of identified alternative properties would be denied by Comstock Township, Enbridge did not present any site plans to the Township for approval (other than use of the county park for staging of frac tanks). To the extent that any of Enbridge’s contingency plans include the use of land for dredge pads, U.S. EPA believes that Enbridge should begin multiple submissions for property use until one is accepted…. velocities from rain and ice melt. high flow. Now that Enbridge has a five year permit from MDEQ for the E-4 containment system, U.S. EPA reiterates that this containment must be in place immediately upon thawconditions in the spring…. approach and any potential dry excavation techniques. Enbridge should also consider other winter work techniques, such as cell build out and dewatering in the Delta via sheet piling. As always, U.S. EPA will continue to work with Enbridge to develop adequate plans and complete the work required by the Order. However, nothing in this letter excuses any noncompliance with the Order nor does it serve as the granting of any extension to any deadline in the Order. U.S. EPA reserves all its rights to pursue an enforcement action for any noncompliance with the Order. The EPA letter also calls into question the ruling of the Joint Review Panel on the Enbridge Northern Gateway. The JRP accepts, without question, Enbridge’s assurances that the company has changed its attitude and policies since the long delay in 2010 in detecting the pipeline rupture in Marshall, Michigan. The JRP, on the other hand, accepts, without question, Enbridge’s assurances that it has expertise in winter oil recovery from a pipeline spill. 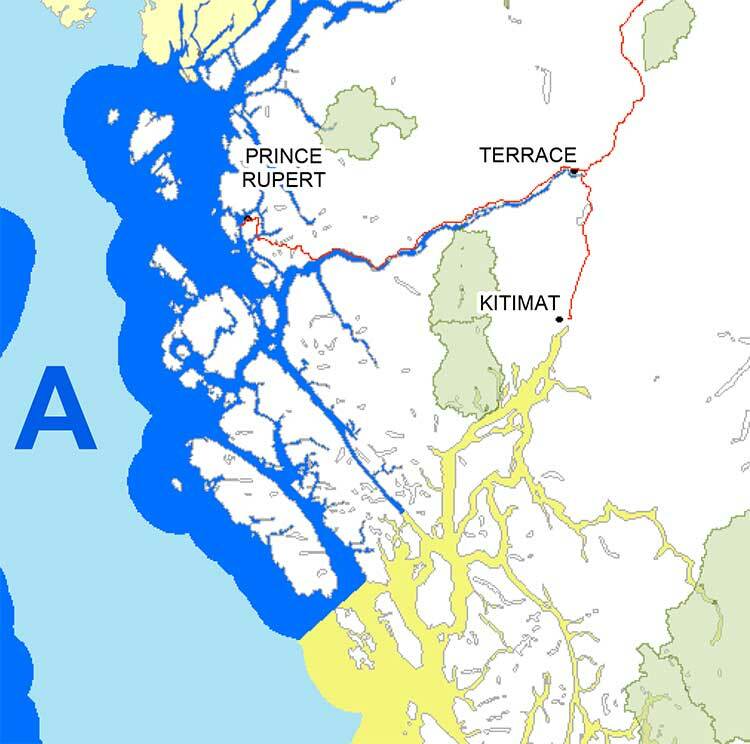 Parties questioned Northern Gateway about locating and recovering oil under ice. Northern Gateway said that Enbridge conducts emergency exercises in winter and that Northern Gateway would learn from those experiences. Northern Gateway outlined a number of oil detection techniques including visual assessment (at ice cracks and along the banks), drills, probes, aircraft, sniffer dogs, and trajectory modelling. 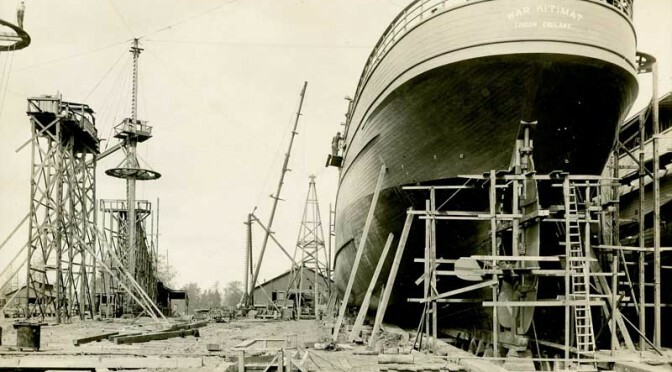 It said that, once located, oil would be recovered by cutting slots into the ice and using booms, skimmers, and pump systems to capture oil travelling under the ice surface. The company said that oil stranded under ice or along banks would be recovered as the ice started to melt and break up. It discussed examples of winter oil recovery operations during Enbridge’s Marshall, Michigan incident, and said that operational recovery decisions would be made by the Unified Command according to the circumstances. environmental sensitivities, and potential for oil recovery at the response site. The Panel finds that Northern Gateway’s extensive evidence regarding oil spill modelling, prevention, planning, and response was adequately tested during the proceeding, and was credible and sufficient for this stage in the regulatory process. 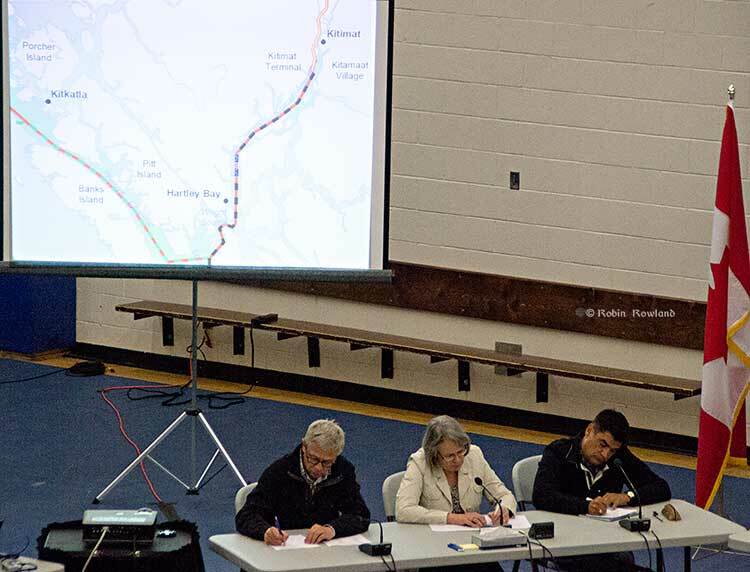 Parties such as the Province of British Columbia, Gitxaala Nation, Haisla Nation, and Coalition argued that Northern Gateway had not provided enough information to inform the Panel about proposed emergency preparedness and response planning. The Panel does not share this view. Northern Gateway and other parties have provided sufficient information to inform the Panel’s views and requirements regarding malfunctions, accidents, and emergency preparedness and response planning at this stage of the regulatory process. Many parties said that Northern Gateway had not demonstrated that its spill response would be “effective.” Various parties had differing views as to what an effective spill response would entail. until the time of the spill event due to the many factors which could inhibit the effectiveness of the response. The Panel finds that Northern Gateway is being proactive in its planning and preparation for effective spill response…. The Panel is of the view that an effective response does not guarantee recovery of all spilled oil, and that that no such guarantee could be provided, particularly in the event of a large terrestrial, freshwater, or marine spill. that it is able to appropriately respond to an emergency for each 10-kilometre-long segment of the pipeline. address these concerns. Northern Gateway said that its emergency response plans would incorporate a target of 6 to 12 hours for internal resources to arrive at the site of a spill. It also said that it would target a response time of 2 to 4 hours at certain river control points. 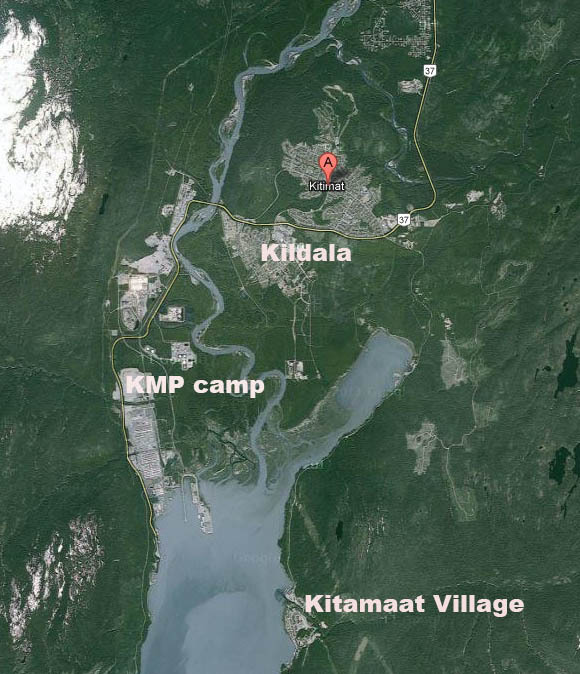 Supporters of David Black’s Kitimat Clean project to build a refinery about 25 kilometres north of Kitimat have been met by skepticism by experts and economists from the Canadian oil patch who keep telling the people of northwestern British Columbia that to create jobs by adding value to Alberta crude is uneconomic. The Americans, apparently, have a different view, with plans announced for shipping projects in Washington State that could handle not only oil shale crude from the Bakken Formation in the Dakotas but also Canadian “heavy crude” aimed at refineries in Californa, refineries that would require new or renovated facilities. So let’s add another question to northwest BC’s skepticism about the Alberta oil patch. Why is uneconomic to refine in Alberta or BC, but apparently increasingly economic to refine in California given the cost of building or rebuilding facilites? 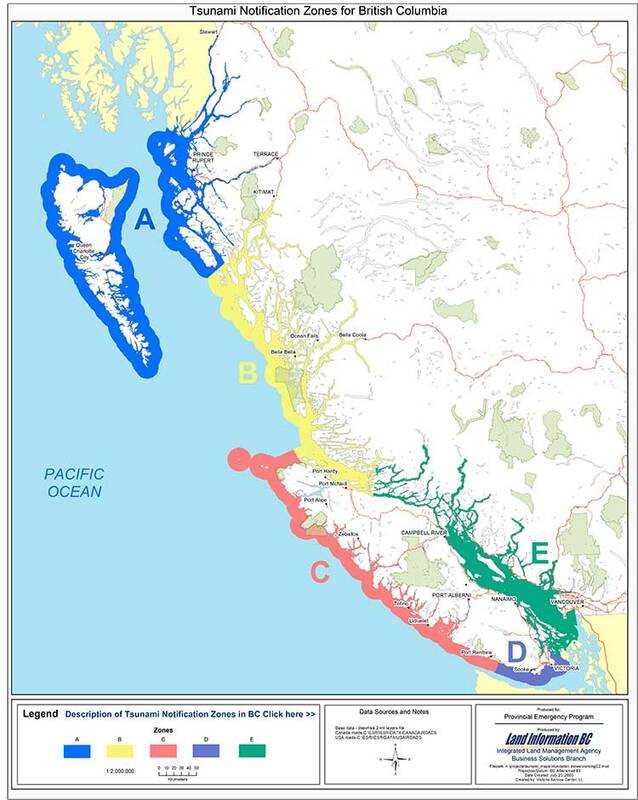 Opponents of the Northern Gateway pipeline have always speculated that any bitumen exported from Kitimat could end up in California rather than markets in Asia. According to reports, the Vancouver, Washington, project plans to load the bitumen on barges for shipment to California, which is likely to cause a storm of controversy with environmental groups in both states, especially if a barge, which has almost no controls compared to a tanker, foundered and ended up on the coast. The New York Times, on Oct. 31, looked at the issue in a report Looking for a Way Around Keystone XL, Canadian Oil Hits the Rails. The issue of moving crude by rail has been gaining traction in recent months, with growing opposition to pipeline projects. But where do those long trains of tank cars full of crude go? The developing rail links for oil sands range across Canada and over the border from the Gulf Coast to Washington and California. Railways can potentially give Canadian producers a major outlet to oil-hungry China, including from refineries in Washington and California. 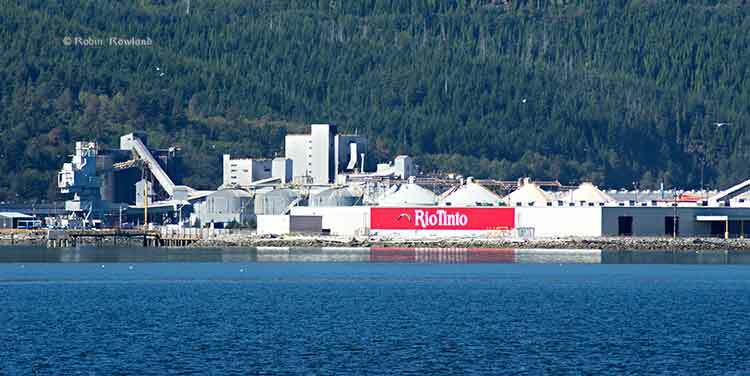 According to the Times, the plans call for two Canadian export terminals. The Americans, on the other hand, are looking toward refineries. Several Washington and Oregon refiners and ports are planning or building rail projects for Canadian heavy crude as well as light oil from North Dakota. The Texas refinery giant Tesoro and the oil services company Savage have announced a joint venture to build a $100 million, 42-acre oil-handling plant in the Port of Vancouver on the Columbia River that could handle 380,000 barrels of oil each day if permits are granted. Not that everything is clear sailing. The Times says there is resistance to a plan to refine heavy crude in California. The city of Benicia, Calif., last month delayed the granting of a permit for Valero Energy’s planned rail terminal at its refinery by deciding to require an environmental impact report after residents expressed concerns that Valero would use the terminal to import Canadian oil sands crude. Tesoro and its partner Savage announced the Vancouver, Washington project in April. With access to rail and existing marine infrastructure, the Port of Vancouver is uniquely positioned to serve as a hub for the distribution of North American crude oil to West Coast refining centers. Tesoro and Savage are ideal partners for this project, having already operated in close partnership for almost ten years on the West Coast. The Tesoro-Savage Joint Venture’s combined capabilities, experience and resources are expected to create substantial benefits for the Port and the Vancouver community in the form of sustainable revenue to the Port and local jobs associated with the facility’s construction and operation. The Tesoro news release quotes Greg Goff, President and CEO of Tesoro. Building upon the recent success of the rail unloading facility at our Anacortes, Wash., refinery, where we have been delivering Mid-Continent crude oil via unit train in an environmentally sound and cost-effective manner, this project is the ideal next step for Tesoro as we drive additional feedstock cost advantage to the remaining refineries in our West Coast system. The project, which would initially have capacity of 120,000 barrels a day and could be expanded to 280,000 BPD, is the biggest so far proposed to help Pacific Coast refineries tap growing output of inland U.S. and Canadian heavy crudes. The project, where North Dakota Bakken and Canadian crude would travel by rail to the marine facility in Vancouver, Washington and then barged to refining centers, is being planned with joint venture partner Savage Companies. Regulators also are considering Valero’s permit request for a 60,000 bpd rail facility at its 78,000 bpd Wilmington refinery near Los Angeles, but in June the area pollution regulator said it would take 18 months to finish an environmental review, permitting and construction. Alon Energy USA also is seeking permits for a rail facility at its Southern California refining system, which shut down late last year as losses mounted on high imported crude costs and low asphalt demand. The company hopes to get those permits by year-end. Valero spokesman Bill Day on Friday declined to say whether Valero would be interested in tapping inland and Canadian crude through the Tesoro project, but noted that the company values flexibility in getting cheaper crudes to its refineries. Asked today about the New York Times report, (at the time of his regular news conference, he hadn’t read the story) Skeena Bulkley Valley MP Nathan Cullen said, “I mean there’s been so much uncertainty, in large part created by this government with respect to moving oil anywhere. This is another proposal, it seems every week you wake up, open the papers and there’s another proposal. Some of them are legitimate, some of them are snake oil. 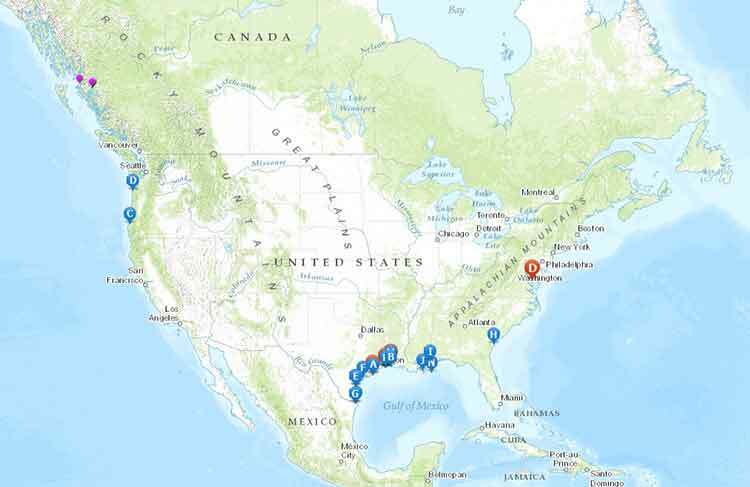 The American Petroleum Institute, the lobby group for US energy companies has launched an interactive map on its website covering liquefied natural gas export projects. CBC: New tsunami warning protocol rolled out in B.C. EmergencyInfoBC Please be advised that @EmergencyInfoBC is the only authorized emergency alert feed for Gov’t of BC. 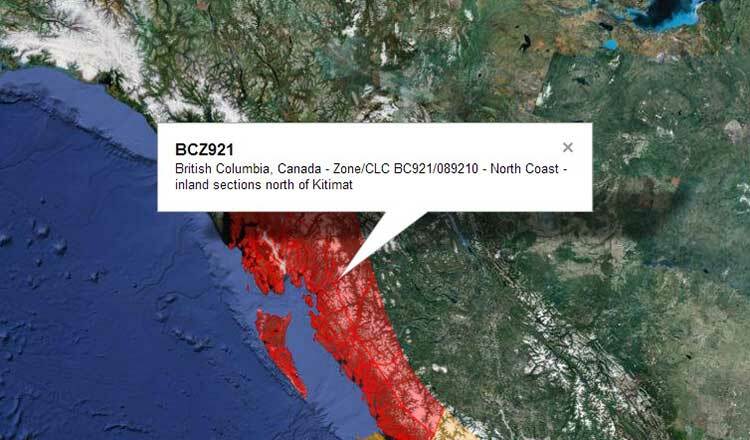 The British Columbia Solicitor General’s department is asking northwest municipalities to “clarify the initial response actions” to the October 27 2012, magnitude 7.7 earthquake off Haida Gwaii and the resulting tsunami warning. In the main letter to the municipalities outlining emergency procedures, the department also offers a time line of its response to the incident. In the letter the province outlines a time line of how the emergency system worked on October 27. It says the provincial Tsunami Notification plan was activated at 8:10 pm. October 27, approximately four minutes after the earthquake. 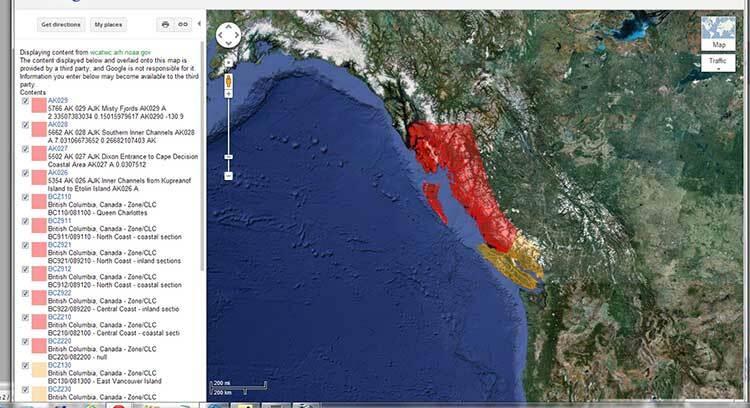 The EMBC (Emergency Management BC) Emergency Coordination Centre initiated an internal resource request to activate the PECC (Provincial Emergency Coordination Centre) and the PREOCs (Provincial Regional Operations Centres). EMBC and Temporary Emergency Assignment Management System (TEAMS) staff were in attendance at PECC and PREOCs by 8:33 pm. “Based on the initial bulletin from WCATTWC, social media staff sent out a message via Twitter” at 8:48 pm At that time EMBC regional offices began contacting communities with potential tsunami risk by telephone. “Subject matter experts from Natural Resources Canada and Canadian Hydrographic Service were contacted by PECC at 8:30 pm and at 9 pm to review the information received from WCATWC. “Based on these discussions, the PENS (Provincial Emergency Notification) was initiated at 9:05 while efforts to make contact with those communities under tsunami warning continued. At 10:45 pm a media conference call was held by the Minister of Justice. On November 7, 2012, the US Geological Survey reported a 6.3 magnitude earthquake took place at 6:01 pm. 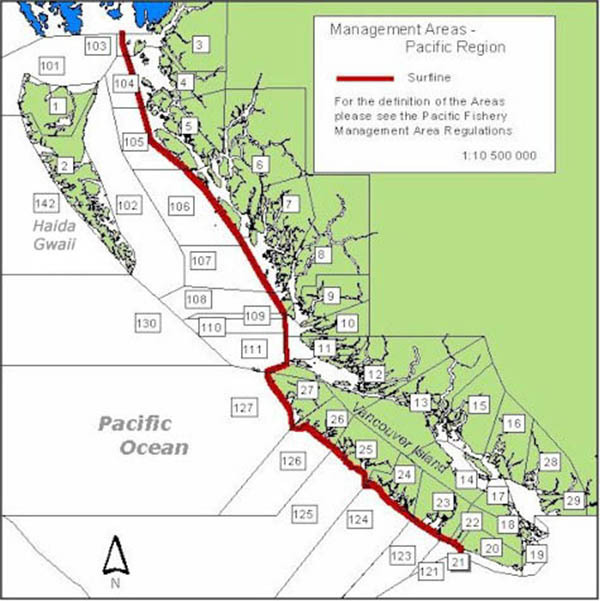 Pacific Standard Time off the west coast of Vancouver Island, 186km (116mi) south southwest of Port Hardy. Read between the lines of the Solicitor General’s letter and a couple of things stand out. While at first the officials say things went fine according to procedures in the book, events appear to show that in practice, the system didn’t work as well as expected on the night of October 27. Second, while EM BC social media staff were, according to the letter, “were actively engaged in informing the public,” there was actually scant evidence of that during the crucial first 90 minutes after the earthquake on Haida Gwaii. While the emergency coordination officials and bureaucrats apparently were well informed about what was happening, the public was not. As I pointed out in an earlier post, differences between the US and Canadian warning systems contributed to the confusion. As well there was a problem on both Twitter and Facebook of rumour, misleading and false information being posted on social media during that crucial 90 minutes. The line about the “the use of social media as a communications tool for public awareness of the event” is a clear indication that not all went well with the EM BC Twitter feed the night of the Haida Gwaii earthquake. While Emergency Info BC is a sort of blog, again you have to know to go there and it is only active during an emergency. There were no posting on the night of the earthquake and tsunami. The last “blog” was during the Johnson’s Landing landslide evacuation in July 2012, and even that doesn’t give much information. Looks like Emergency Info doesn’t understand that a blog entry that says “no danger, nothing much is happening” is just as important as evacuation instructions. The first indication of whether or not there would be major danger to the BC coast on Oct. 27 was at Langara Island at 9:16 pm. Local officials in northwest BC were monitoring Langara and the relatively low surge indicated–at least at that time– that danger was not as great as feared. 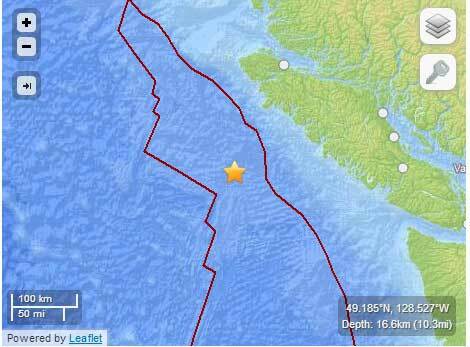 Yet it was only seven minutes earlier that EM BC activated the Provincial Notification Program at 9:05, and that was an hour after it was known that the earthquake was 7.7 in magnitude, which had the potential for catastrophic damage. The tweets that I saw about the small surge at Langara, came from Prince Rupert. 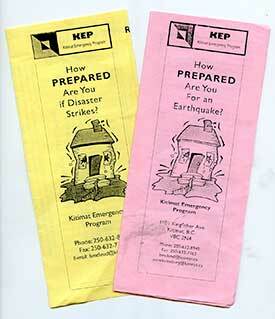 It is in a situation like the Langara monitoring that the Emergency Info blog would have been relevant. The need for constant official updates is clear. Earthquakes do not work 8:30 to 4:30, Monday to Friday. The province has to be able to activate emergency notification much faster. If a web journalist whether working for the mainstream media or a responsible individual on a small site can tweet or post in seconds, usually working from a home office or even a smart phone, emergency officials can do the same. In these days, travel by government officials is often frowned upon. A couple of months from now, when New York and New Jersey have recovered from the Superstorm Sandy and this weeks Nor’easter, a visit from BC emergency officials is in order to see how it is done. A new draft report for the U.S. Congress from the United States Pipeline and Hazardous Materials Safety Administration takes new aim at Enbridge for failures in its pipeline leak detection and response system. Not that the PHMSA is singling out Enbridge, the report is highly critical of leak detection systems on all petroleum and natural gas pipeline companies, saying as far as the United States is concerned, the current pipeline standards are inadequate. The release of the “Leak Detection Report” written by Kiefner & Associates, Inc (KAI) a consulting firm based in Worthington, Ohio, comes at a critical time, just as Enbridge was defending how it detects pipeline leaks before the Joint Review Panel questioning hearings in Prince George, where today Enbridge executives were under cross-examination by lawyers for the province of British Columbia on how the leak detection system works. In testimony on Wednesday, October 12, Enbridge engineers told the Joint Review Panel that the company’s pipelines are world-class and have a many prevention and detection systems. Northern Gateway president John Carruthers testifed there is no way to eliminate all the risks but the company was looking for the best way of balancing benefits against the risk. However, the KAI report points out that so far, all pipeline company cost-benefit analysis is limited by a short term, one to five year point of view, rather than looking at the entire lifecycle of a pipeline. Two Enbridge spills, one the well-known case in Marshall Michigan which saw bitumen go into the Kalamazoo River and a second in North Dakota, both in 2010, are at the top of the list in the study for PHMSA by the consulting firm. The highly technical, 270-page draft report was released on September 28, as Enbridge was still under heavy criticism from the US National Transportation Safety Board report on the Marshall, Michigan spill and was facing penalties from the PHMSA for both the Marshall spill and a second in Ohio. Looking at overall pipeline problem detection, KAI says the two standard industry pipeline Leak Detection Systems or LDS didn’t work very well. Between 2010 and 2012, the report found that Computational Pipeline Monitoring or CPMs caught just 20 per cent of leaks. Another system, Supervisory Control and Data Acquisition or SCADAs caught 28 per cent. Even within those acronym systems, the KAI report says major problem is a lack of industry standards. Different companies use different detector and computer systems, control room procedures and pipeline management. The report also concludes that the pipeline industry as a whole depends far too much on internal detectors, both for economic reasons and because that’s what the industry has always done. External detectors, the report says, have a better track record in alerting companies to spills. The consultants also say there are far too many false alarms in spill detection systems. Although the KAI report concentrates on the United States, its report on Enbridge does raise serious questions about how the company could detect a pipeline breach or spill in the rugged northern British Columbia wilderness where the Northern Gateway Pipeline would be built, if approved by the federal government. The report comes after the United States Congress passed The Pipeline Safety, Regulatory Certainty, and Job Creation Act, which was signed into law by President Barack Obama on January 3, 2012. 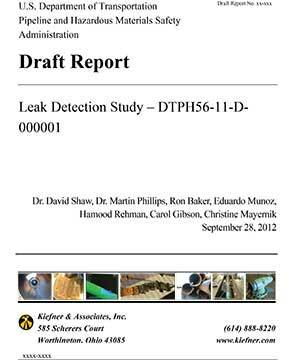 The law called on a new leak detection study to be submitted to Congress that examines the technical limitations of current leak detection systems, including the ability of the systems to detect ruptures and small leaks that are ongoing or intermittent. The act also calls on the US Department of Transportation to find out what can be done to foster development of better technologies and economically feasible ways of detecting pipeline leaks. The final report must be submitted to Congress by January 3, 2013. (The draft report does note in some ways, Canadian standards for detecting pipeline leaks are better than those in the United States. For example, Canada requires some pipeline testing every year, the United States every five years. It also finds European pipeline monitoring regulations also surpass those in the United States). The main identified technology gaps – including those identified by operators – include: reduction or management of false alarms; applicable technical standards and certifications; and value / performance indicators that can be applied across technologies and pipelines. Integration using procedures is optimal when it is recognized that alarms from the technology are rarely black-and-white or on/off situations. Rather, at a minimum, there is a sequence: leak occurrence; followed by first detection; followed by validation or confirmation of a leak; followed by the initiation of a shutdown sequence. The length of time that this sequence should take depends on the reliability of the first detection and the severity of the consequences of the release. Procedures are critical to define this sequence carefully – with regard to the technology used, the personnel involved and the consequences – and carefully trained Personnel are needed who understand the overall system, including technologies and procedures. We note that there is perhaps an over-emphasis of technology in LDS. A recurring theme is that of false alarms. The implication is that an LDS is expected to perform as an elementary industrial automation alarm, with an on/off state and six-sigma reliability. Any alarm that does not correspond to an actual leak is, with this thinking, an indicator of a failure of the LDS system. Instead, multiple technical studies confirm that far more thought is required in dealing with leak alarms. Most technologies infer the potential presence of a leak via a secondary physical effect, for example an abnormal pressure or a material imbalance. These can often be due to multiple other causes apart from a leak. The report takes a critical look at the culture of all pipeline companies which divides problems into leaks, ruptures and small seeps. Under both pipeline practice and the the way problems are reported to the PHMSA in the US a “rupture is a situation where the pipeline becomes inoperable.” While a rupture means that a greater volume of petroleum liquid or natural gas is released, and is a higher priority than a leak or seep, the use of language may mean that there is a lower priority given to those leaks and seeps than the crisis created by a rupture. Precisely the same technology, applied to two different pipelines, can have very different results. Leak Detection Systems do not have performance measures that can be used universally across all pipelines. Compounding the problem are different computer systems where software, program configuration and parameter selection all contribute, in unpredictable ways, to overall performance. Many performance measures present conflicting objectives. For example, leak detection systems that are highly sensitive to small amounts of lost hydrocarbons are also prone to generating more false alarms. The performance of a leak detection system depends critically on the quality of the engineering design, care with installation, continuing maintenance and periodic testing. Even though an internal technology may rely upon simple, basic principles, it is in fact, complex system that requires robust metering, robust SCADA and telecommunications, and a robust computer to perform the calculations. Each of these subsystems is individually complex. Differences in any one of these factors can have a dramatic impact on the ultimate value of a leak detection system. There is no technical reason why several different leak detection methods can not be implemented at the same time. In fact, a basic engineering robustness principle calls for at least two methods that rely on entirely separate physical principles. The report strongly recommends that pipeline companies take a closer look at external leak detection systems. Even though the US Environmental Protection Agency began recommending the use of external detection as far back as 1988, the companies have resisted due to the cost of retrofitting the legacy pipeline network. (Of course if the pipeline companies had started retrofitting with external detectors in 1988 they would be now 24 years into the process). External leak detection is both very simple – relying upon routinely installed external sensors that rely upon at most seven physical principles – and also confusing, since there is a wide range of packaging, installation options, and operational choices to be considered. External leak detection sensors depend critically on the engineering design of their deployment and their installation. External sensors have the potential to deliver sensitivity and time to detection far ahead of any internal system. Most technologies can be retrofitted to existing pipelines. In general, the resistance to adopting external technologies is, nevertheless, that fieldwork on a legacy pipeline is relatively expensive. A particular organizational difficulty with leak detection is identifying who “owns” the leak detection system on a pipeline. A technical manager or engineer in charge is typically appointed, but is rarely empowered with global budgetary, manpower or strategic responsibilities. Actual ownership of this business area falls variously to metering, instrumentation and control, or IT. The report calls for better internal standards at pipeline companies since with leak detection “one size does not necessarily fit all”. It also notes that “flow metering is usually a central part of most internal leak detection systems,” but adds “flow meter calibration is by far the most laborious part of an internal system’s maintenance. While a company may do a cost benefit analysis of its leak detection system and risk reduction system it will generally emphasize the costs of the performance and engineering design of the leak detection system, the companies usually place less emphasis on the benefits of a robust system, especially the long term benefits. At present the pipeline companies look at the benefit of leak detection as a reduction in risk exposure, or asset liability, “a hard, economic definition… understood by investors.” But the report adds that leak detection systems have a very long lifetime and over that life cycle, the cost-benefit approaches the reduction in asset liability caused by the system, when divided by annual operational costs. However, since pipeline companies budget on a one to five year system the long term benefit of robust, and possibly expensive spill detection is not immediately apparent. The consultants studied 11 US oil spills, the top two with the greatest volume were from Enbridge pipelines. The others were from TE Products Pipeline, Dixie Pipeline, Sunoco, ExxonMobil, Shell, Amoco, Enterprise Products, Chevron and Magellan Pipeline. Not all US spills were used in the KAI report, the 11 were chosen for availability of data and documentation. The largest spill in the KAI study was the pipeline rupture in Michigan at 843,444 gallon (3,158,714 litres) which has been the subject of continuing media, investigative and regulatory scrutiny. The second spill in North Dakota, has up to now received very little attention from the media. That will likely change once the US Congress gets the final report. Even though the Neche, North Dakota spill, has been described as “text book case” of a pipeline shutdown, there was still a large volume of oil released. The pipeline was shutting down when the ruptured occurred. Documentation indicates that a SCADA alarm did sound coincident with the most likely time of the rupture. It was dismissed. The line was shut down for around 10 hrs and crude oil would have drained from the line during this time. On pipeline start up, alarms in the control room for the ruptured pipeline sounded. They were dismissed. This was repeated two more times. The pipeline was shut down when the control room was notified of the discharge of the crude oil by a member of the public. The time to shut down the pipeline is not relevant here because of the 17 hours that elapsed after the rupture occurred. 1. Instrumentation on a pipeline that informs a controller what is happening to the pipeline must be definitive in all situations. 2. However, the instrumentation did provide warnings which went unheeded by controllers. 3. Instrumentation could be used to prevent a pump start up. 4. Operators should not rely on the public to tell them when a pipeline has ruptured. 5. Pipeline controllers need to be fully conversant with instrumentation response to different operations performed on the pipeline. 6. If alarms can be cancelled there is something wrong with the instrumentation feedback loop to the controller. This is akin to the low fuel warning on a car being turned off and ignored. The pipeline controller is part of an LDS and failure by a controller means the LDS has failed even if the instrumentation is providing correct alarms. 7. If the first SCADA alarm had been investigated, up to 10 hours of pipeline drainage to the environment might have been avoided. If the second alarm had been investigated, up to 7 hours of pumping oil at almost full capacity into the environment might have been avoided. 8. CPM systems are often either ignored or run at much higher tolerances during pipeline start ups and shutdowns, so it is probable that the CPM was inoperative or unreliable. SCADA alarms, on the other hand, should apply under most operating conditions. At approximately 11:37 pm. local time, on January 8, 2010, a rupture occurred on Enbridge’s Line 2, resulting in the release of approximately 3000 barrels or 158,928 gallons of crude oil approximately 1.5 miles northeast of the town of Neche, North Dakota, creating the sixth largest spill in the US during the study period. At 11:38 pm., a low-suction alarm initiated an emergency station cascade shutdown. At 11:40 pm., the Gretna station valve began closing. At 11:44 pm., the Gretna station was isolated. At 11:49 pm., Line 2 was fully isolated from the Gretna to Donaldson pump stations. Documentation indicates a rapid shut down on a low suction alarm by the pipeline controller. From rupture to shut down is recorded as taking 4 minutes. The length of pipeline isolated by upstream and downstream remotely controlled valves was 220,862 feet. 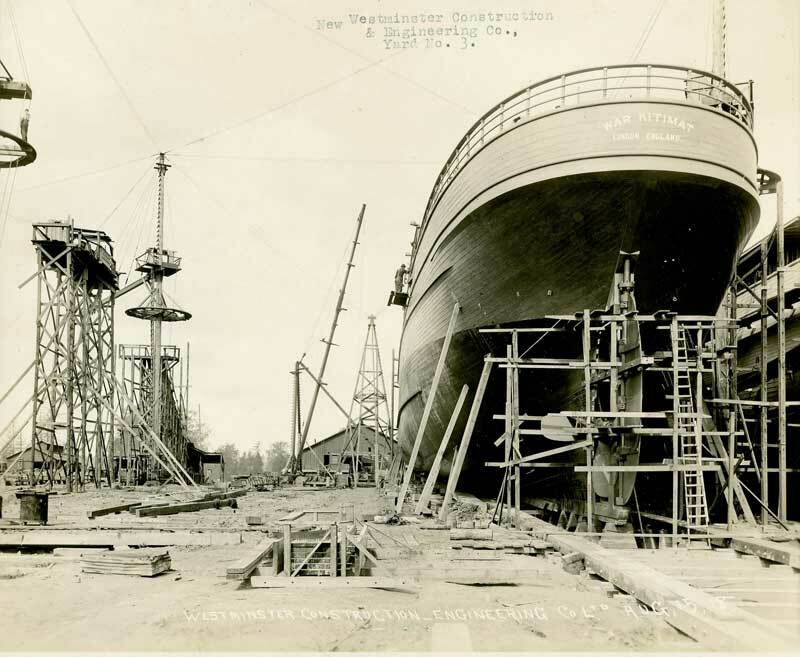 The inventory for this length of line of 26-inch diameter is 799,497 gallons. 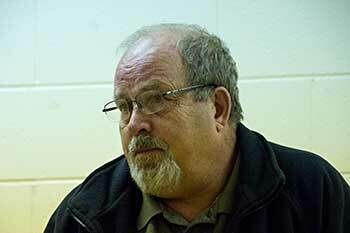 The release amount was around 20 per cent of the isolated inventory when the pipeline was shut down. The orientation of the 50-inch long rupture in the pipe seam is not known. The terrain and elevation of the pipeline is not known. The operator took around 2 hours and 40 minutes to arrive on site. It is surmised that the rupture orientation and local terrain along with the very quick reactions by the pipeline controller may have contributed to the loss of around 20 per cent of the isolated inventory. The controller was alerted by the SCADA. Although a CPM system was functional the time of the incident it did not play a part in detecting the release event. It did provide confirmation. 1. This release is documented as a text book shut down of a pipeline based on a SCADA alarm. 3. Although a textbook shut down in 4 minutes is recorded, a large release volume still occurred. 4. The release volume of 158,928 gallons of crude oil is the sixth largest hazardous liquid release reported between January 1, 2010 and July 7, 2012. 5. The length of pipeline between upstream and downstream isolation valves is long at 41.8 miles. 6. If not already performed, the operator should review potential release volumes based on ruptures taking place at different locations on the isolated section.